Over the past 6 years I have been designing and developing a systematic approach to combat marksmanship that builds a shooter from the ground up. This system is designed to train a shooter to handle, operate, carry and control a pistol, carbine or shotgun in a tactical environment. The application of this system is very robust and can be applied to the military, law enforcement and private citizens. This system is called the Combat Training System or CTS. The techniques that are taught in CTS have been designed, developed, tested and evaluated by RB1 SME's prior to being incorporated into our training courses. Our SME's have extensive real world combat experience. All have multiple combat deployments to the Middle East and other areas of operations as members of Australia's Special Operations Task Group and U.S Special Operations Command. Our CTS training techniques are unique in many ways. We have evolved current techniques to be faster and more efficient and developed our own techniques bringing new methods of deploying weapons and accessories to the tactical shooting world. 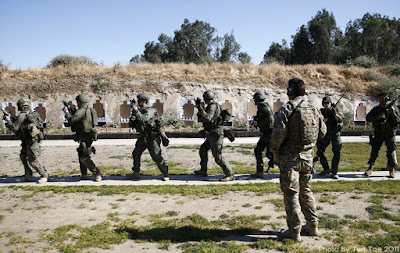 The CTS techniques have been designed to teach a shooter how to systematically and subconsciously apply the fundamentals of combat marksmanship and weapons manipulation to maintain high hit probability and lethality and, to keep the gun running in a tactical environment. RB1 Power Turns - This method of turning to engage a threat is based on our asymmetric shooting platforms and allows the shooter to turn and engage a threat from 90/180 degrees up to .50 sec faster than standard turns and pivots. A saving of .50 sec in a gun fight can mean all the difference! The principle action in this technique is driving the outside hip towards your threat. This creates speed of movement and power similar to a boxer throwing a straight right punch. We incorporate angular momentum from the upper body to increase the speed of movement. The shooter needs to be comfortable shooter on the natural side with both the left foot or the right foot forward. This technique has direct cross over to our barricade shooting method and combatives program, allowing the shooter to perform strikes and parries to incapacitate or control non-combatants as required. 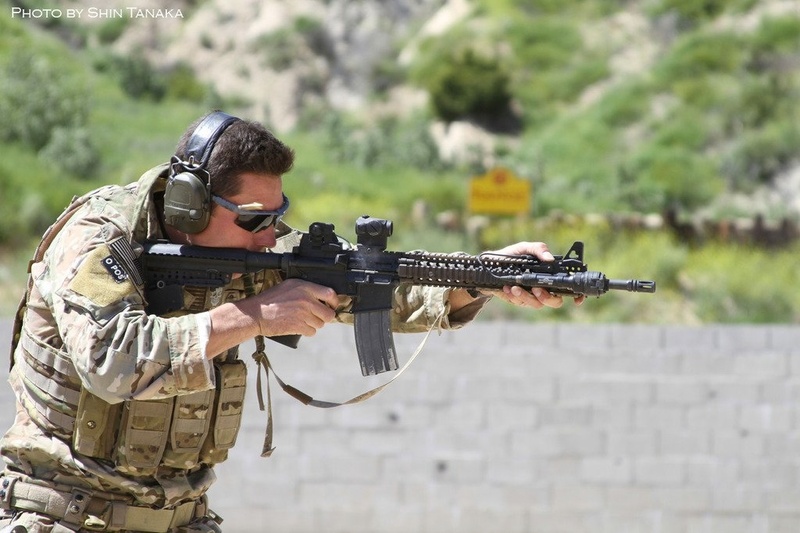 Transitioning to secondary weapons - Our method of transitioning from primary to secondary and back to primary have been developed for speed and efficiency as well as to allow the shooter to perform visual checks to determine why the weapon failed! Key points in this technique are tuning the primary weapon palm down with the support hand, and recovering the primary at the balance point of the weapon allowing the shooter to visually inspect the chamber as he re-holsters the secondary. System Check - Our system check allows the shooter to visually inspect the position of the bolt after an engagement by rolling the carbine/shotgun to the left or returning the pistol to the high ready. This check verifies the condition of the weapon, an important procedure under extreme combat stress where the shooter can unintentionally fail to recognize a weapon stoppage preventing him from engaging. Flashlight Deployment - Our method of incorporating a hand held flashlight during low light engagements is an adaptation of another well known technique. However, with the RB1 method, the shooter is able to illuminate the sight picture and the threat at the same time. This aides the shooter to easily check the sight package prior to engaging. The flashlight is held in the support hand, hammer fist style, indexing the fist against the cheek bone. This aligns the light source with the shooters eyes, sights and target, giving him an excellent view of the situation. This technique does rely on being competent at shooting with the strong hand only. Pistol: The RB1 method of gripping the pistol gives the shooter greater recoil management than any other technique currently being taught. The grip looks similar to other grips being taught however the arm placement is the true key to the RB1 pistol grip method and recoil management. Having the arms parallel with the axis of the barrel increases the grip pressure at the top of the frame, limiting the weapons natural fulcrum action when fired. Our carbine grip leverages of the principles taught for the pistol, however the support hand is forward on the hand-guard. Carbine: Our carbine grip will see the shooter with the support thumb indexing the target as per the pistol grip and therefore clear from the IR beams of the laser/illuminator. The alternate grip gives the shooter the option of wrapping the support thumb over the top of the rail interface further decreasing the fulcrum action during firing. The support arm should be parallel with the axis of the barrel as per the pistol grip allowing the shooter to draw the weapon into the shoulder pocket with both strong and support hands, increasing recoil management. This technique allows the shooter to drive the weapon faster from target to target by pulling and pushing the front of the gun. Accuracy is also increased as a greater portion of the barrel is being stabilized by the support hand. 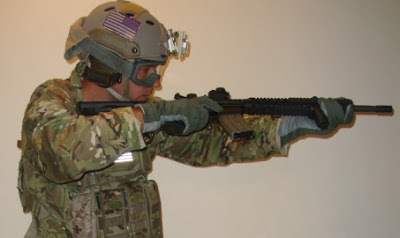 The elbow of the support hand should form a slight obtuse angle allowing the shooter to employ RB1 Combative techniques when required. Y-Factor - We a true believers in providing the reasons why our techniques are taught as well as how and where they are applied. Giving the student a reason for learning increases the desire to learn and is seen as the crux of the adult learning process. These are some examples of the methodology and techniques that form the RB1 Combat Training System. RB1 - "innovation not imitation!" Glad to have found your videos and a blog. there are so many people out there that are half assed. Your grip explanations make perfect sense. I've been experimenting with different pistol gripping techniques and how to reduce the recoil to get more bullets on target faster. Its also useful info for research of my fiction writing. Tactical TV is it ! A couple of weeks ago I returned a loaner rifle to the maker. When the agency first gets your profile requirements they will attempt to match the job up with someone they already have in their files.